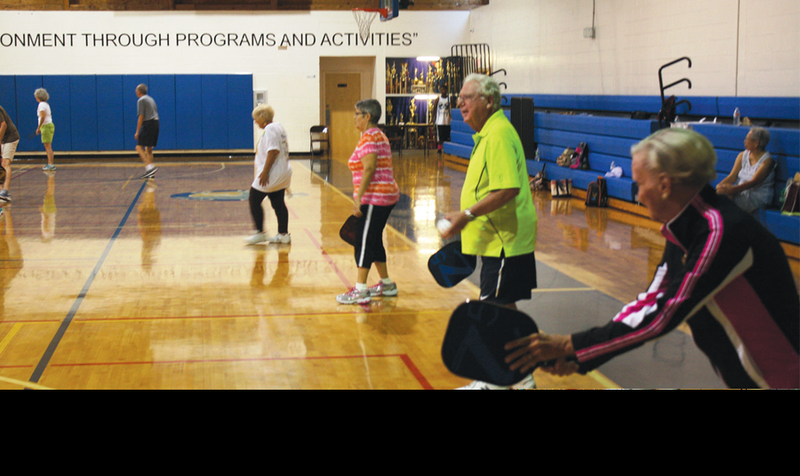 The Pickleball craze combining the best of badminton, racquetball and tennis is becoming popular for residents of all ages and abilities at Pompey Park Recreation Center and Delray Beach Community Center. Pickleball is a fun and active racquet game. The game can be played indoors or outdoors and is traditionally played on a badminton size court with a net similar to what’s found in tennis but lowered to just under 3 feet. Pickleball players use a wooden paddle or hard plastic paddle to hit a ball similar to a plastic wiffle ball, serve underhand and allow the ball to bounce once on the opposing player’s side before being returned. “The Pickleball at Pompey Park is great because it’s social open play matching up players of all skill levels. We have four courts of games playing simultaneously,” said Delray Beach resident and Pickleball aficionado Merrill Beveridge. Beveridge compares the game to tennis but said it’s less strenuous on her body. She said the court is about one-third the size of a tennis court and that games are played to 11 points with the winner having to win by two. Social Pickleball Night is currently held Pompey Park Recreation Center, 1102 NW Second St., while summer camps are in session. Cost is free at this time. Starting August 18, Pickleball will move to a timeslot from 8-11a.m., Monday to Friday at Pompey Park. On August 23, a Saturday 1-4p.m. Pickleball schedule will also open at Pompey Park. Players can bring their own Pickleball racquet or one will be provided by staff.